Gucci "New Ace" low-top sneaker in GG supreme canvas. Signature blue/red/blue web detail at sides. Lace-up front; leather trim at tongue. 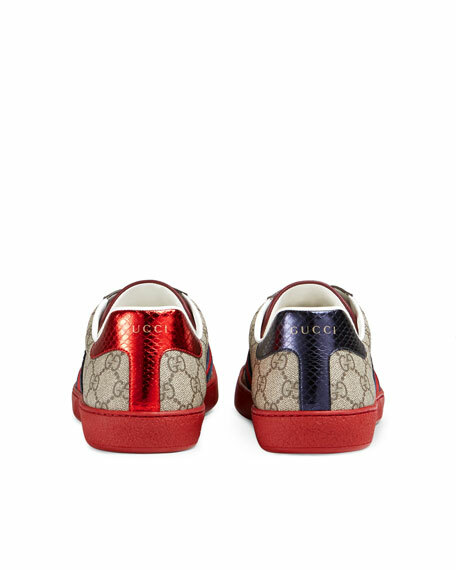 Red and blue snakeskin panels with Gucci logo at heels. Guccy print sneaker in SEGA font, used with permission of Sega Holdings Co., Ltd. Red metallic leather detail at heel; gold embroidered bee. 0.4" (10mm) height. Lace-up vamp. Black grosgrain trim. Rubber sole. Made in Italy. Gucci low-top sneaker in GG supreme canvas with butter leather and suede trim. Blue/orange/blue Web detail at sides. Printed gold bee at back. Oval enameled detail with metal Double G. Toe: 22mm height; Heel: 30mm. Lace-up front. Rubber outsole. Made in Italy. Gucci trekking sneaker in leather, technical canvas, and suede. 0.4" chunky heel with platform. Reinforced round toe with logo. Lace-up vamp. Rubber Gucci game patch at tongue. Perforated padded top collar. Leather lining. Rubber outsole. "FlashTrek" is made in Italy. Gucci leather high-top sneaker in gray leather. 0.25"H platform heel; 4.5 shaft height. Red/green/red Web at sides. Padded blue and red nylon stripe at the ankle. Gold leather detail at the back. Round toe. Lace-up front. Rubber sole. "Ace" is made in Italy.